Faster and almost as cheap as before, Western Digital unleashes a new take on its formerly SATA Blue SSDs. Just two months after revealing the high-performance WD Black SN750, Western Digital is seemingly hot on the heels of another breakthrough. 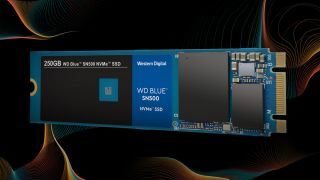 Launched this morning, the WD Blue SN500 is less about record-smashing transfer speeds and more focused on value—delivering NVMe speeds for little more than the cost of a SATA solid-state drive. The WD Blue series drives were historically constrained to the slower SATA interface, available in M.2 and 2.5-inch flavors. But now there's a nimbler option being sold in both 250GB and 500GB capacities. Priced at $54.99 and $77.99, respectively, Western Digital promises sequential read speeds of up to 1,700MB/s and sequential write speeds of up to 1,450MB/s. Compared to the company's top-end WD Black, which blew me away with 3,419MB/s and 2,992MB/s read/write speeds in my own testing, these figures aren't exactly impressive until you consider the savings. Whereas the SN750 costs $129.99 for 500GB of storage, the WD Blue SN500 costs around 40 percent less. It's also a huge step up from the claimed 560MB/s and 530MB/s read/write rates of the $72.99 SATA III WD Blue, yet it'll only set you back a mere five bucks more. Needless to say, there's a strong case to be made for the WD Blue SN500. Cheaper storage options are always welcome, even if they're often compromised solutions. Whether or not real-world testing data reflects company claims remains to be seen. Stay tuned to PC Gamer for our inevitable in-depth impressions.